Fill out our simple form and get quotes from local pagoda suppliers. Pagoda hire is a really popular and versatile solution for any event. 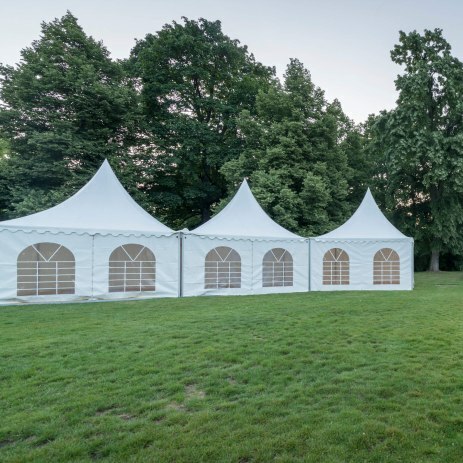 Pagoda marquees can be used independently or they can be linked up to a main marquee or attached to a house or building. They are often seen as entrances or porches welcoming guests into larger constructions. For more information on pagodas for hire, submit a quote request today. Pagodas are extremely versatile tents, idea for parties or country shows...you can join them together to create large spaces for an affordable wedding or party. What will you be using the pagoda for? If you are considering pagoda marquee hire - they are also known as Chinese hat marquees - their unique style adds an interesting twist. What sets them apart is their recognisable peaked roof. Whether you are looking for catering stand options - or other stall or stand options, for that matter - for a carnival, festival or parade or you are contemplating using them for your wedding, your pagoda or pagodas will impress visitors and guests alike. For wedding marquee hire packages and any other information regarding your pagoda marquee requirements, simply submit a quote request.